Normally on my blog, I’m the one who tells the stories and spouts my opinion to anyone who will listen. Well, not today! Today I have a very special guest blogger. She has known me since second grade and has earned the right to say anything she pleases on my blog. Well, I’ve been asked by my friend to be a guest blogger today. We all have that friend. The one who makes us push our limits, get out of our comfort zone. Yes, Susan is that friend for me. Always asking me to do stuff I don’t want to do ! 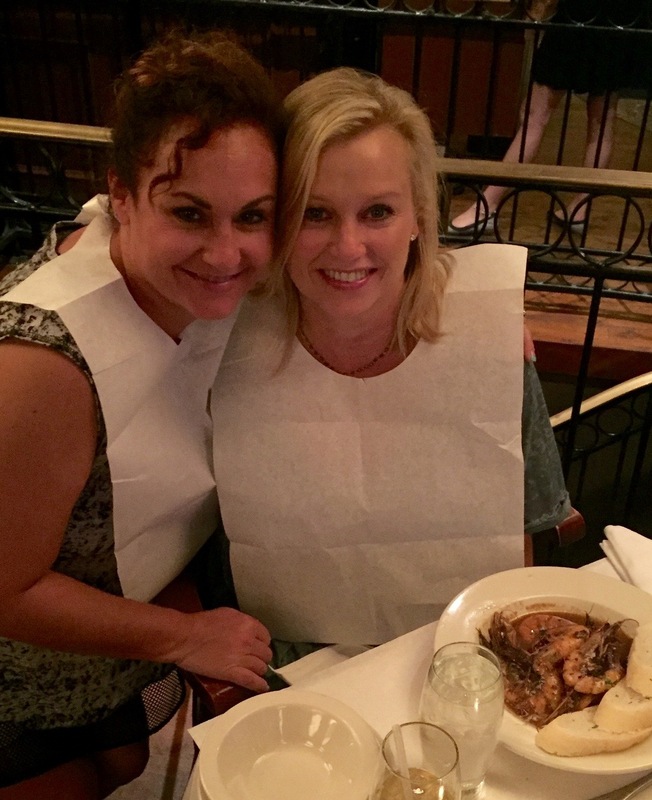 But because she’s that friend for me, here I am writing about our fun trip to New Orleans. Well sure!!! New Orleans, girl trip, the best food on the planet!!! Duh, of course I will, who could say no to that? Monday I’m off to the Crescent City to pick up my lifelong friend, author and chef extraordinaire, Sue, from the airport. On the way, she gives me all the details of our trip. She has been picked to shoot a TV commercial for TONY CHACHERE’S, my favorite seasoning ever. We have no trouble finding the hotel get checked in and meet up with the other party. At this point the advertising people are with us and we head out to the place where the commercial is to be shot the next day. We tour the small carnival at the New Orleans city park and meet the director . He is so high energy and very understanding of the fact that he will be working with amateurs and not trained actors. He tells everyone don’t be nervous just have fun! We all immediately feel better about the coming day of work. ( I say this as if I’m working too; it is hard work being the supportive one I tell you) The ad execs treat us all to beignets and coffee and take us back to the hotel to get ready for dinner with the Chachere’s . Now at this point Sue and I are so excited! 1) we get to eat and 2) we are gonna meet the Chachere’s !!!! To us both, just the thought of it got us excited. We both are true cooks and foodies and have used Tony’s all our lives!!! I mean it is the best seasoning EVER !!! I really do use it in everything !!! So we get to visit and catch up as we are getting ready, like old times. These visits are rare for us so it really was great just getting to catch up face to face, brag on the kiddos and such. We truly are both blessed with great families. So we have the name of the place where we’re supposed to be meeting up with everyone. On the way out we Knock on the door of the Kate Stuart, the other girl picked for the spot. She’d brought a friend with her from Wisconsin. They were–younger. We are now officially old and we may need to change and put on more makeup!! Um, hello, can we call the derm real quick and get a little Botox? So on with the story….it took a little gps to find the meeting place but we made it !!! Here are the Chachere’s !!! They turned out to be just the sweetest people …completely approachable and unassuming, so happy to meet us and for us to be there. We talk about where we were from, how and why they picked Susan for the commercial, and in general just got to know them. They treated us all to a wonderful meal at Chophouse, a very nice steakhouse in the French Quarter. Mr. Don Chachere walked us back to the hotel. Yes he’s the CEO of the company! He is the sweetest man. Such a southern gentleman. Sue and I both just loved him. Thank you, Rennie!!! I’ll pick up with Day 2. We showed up for the shoot and realized what a big production this was. There were at least 60 people on the set between the extras, production team, wardrobe, makeup, caterers, etc. It was overwhelming to say the least. We’d had no idea what to expect in terms of scale. The great news was I managed to have my dear friend placed right behind me during filming, so she would be seen on the commercial. What fun! bathroom after the makeup was done and took care of it. We also put a little curl in my hair. It was board flat, I tell you. The joke was soon on all of us when I immediately began sweating like crazy in the New Orleans August heat. I was wearing jeans, a tank, a long-sleeved shirt, and an apron. I told the director I was trying my best not to sweat. He laughed hysterically and said that was the craziest thing he’d ever heard–trying not to sweat. I was nervous with all those people staring expectantly too. So, that didn’t help my sweating issue, let me tell you. But we all got through it, after about fifty or so, takes. And lots of blotting of flaking mascara from underneath my eyes. Oops. It was a very exciting and fun experience! 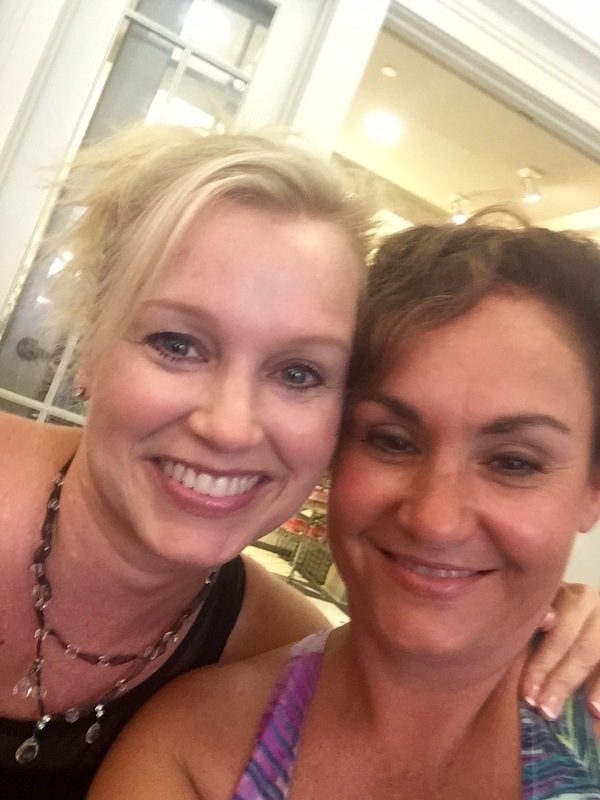 I’m thrilled to have been included and to have my friend with me to help control my nerves. We had the most amazing meal at Mr. B’s Bistro after our day ended. If you ever have the chance to try the barbecue shrimp there, don’t pass it up. Best meal ever! 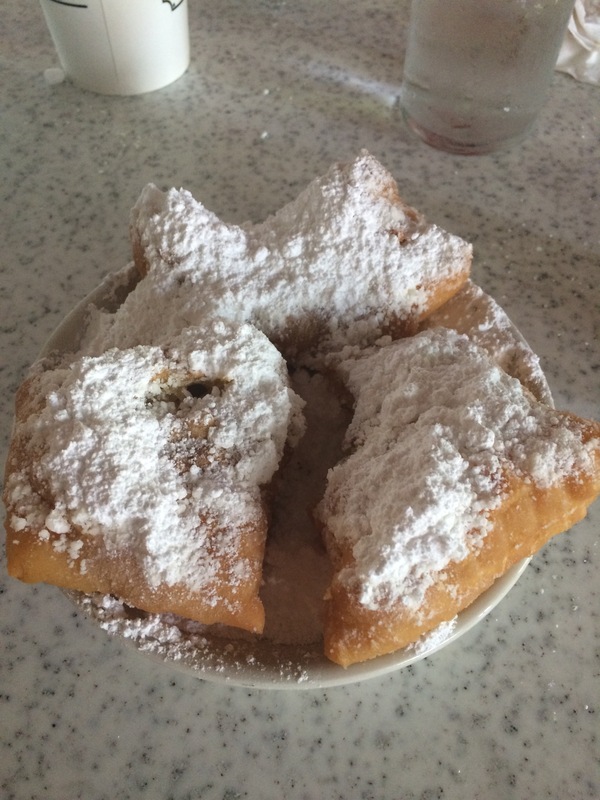 Of course, we stopped at Cafe du Monde for beignets on the way to the airport the next morning. Rennie and I are already planning our next gastro tour of the Crescent City. Next Alpha, Beta, or Somewhere in Between? Thanks for stopping by, Gerald! Great friends are the most fun to do grand adventures with, in my opinion! !